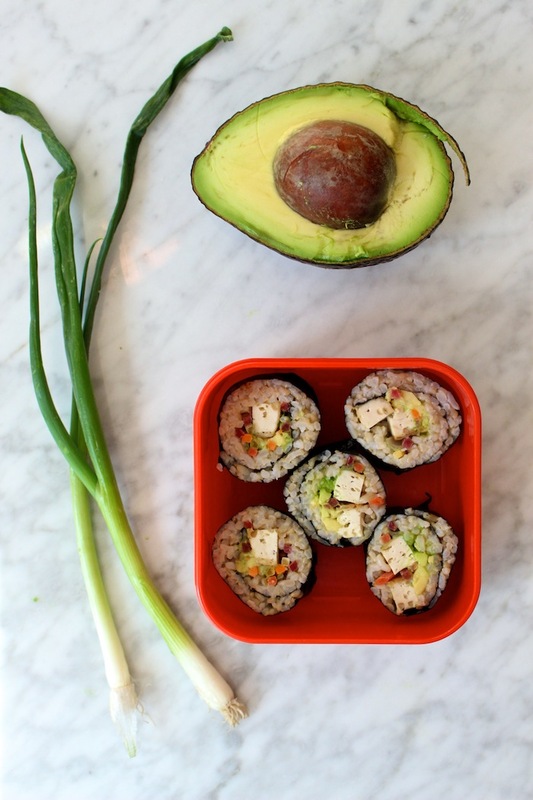 To complete our month of packable, low-so-good lunches (also known as April), I want to tell you about the almighty Lunch Roll. 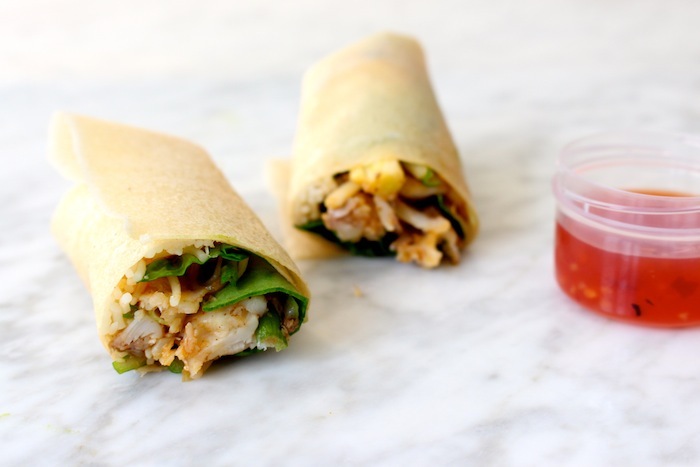 The principle behind the Lunch Roll is very basic: you take a few ready-to-eat-things (including a good slather of a something sticky or pasty and edible), and wrap it all up in another ready-to-eat-thing. It’s very simple lunch math. Now the hard part is finding those things in low-sodium form. Some of the most popular rolls tend to be the lavash roll (sodium) filled with prepared hummus or pesto (sodium) and pre-cooked deli meat or chicken (sodium). 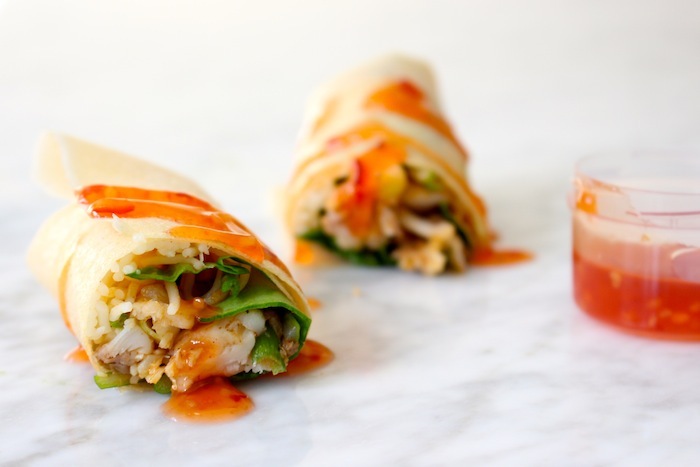 Of course, there is also rice paper rolls (sodium) that get filled with pre-made peanut sauces (sodium), precooked and marinated shrimp or chicken (sodium), and noodles (most likely sodium). But don’t give up on the Lunch Roll just yet, because there are many ways to make a low-so-good wrap with endless choices, and without all the sodium. I’ve discussed the amazingness of the collard wrap before, but for those who aren’t ready to dive into raw, leafy greens just yet, let’s start with these three options: sushi seaweed or nori (with 0mg), butter lettuce, and Paleo Wraps (made simply of coconut meat!). They are all pliable (perfect for rolling), they all contain zero mg of sodium, and they all keep those yummy fillers packed up nicely, ready for transport to your mouth. As for what should go inside each of these, it’s kind of a choose your own roll adventure situation. 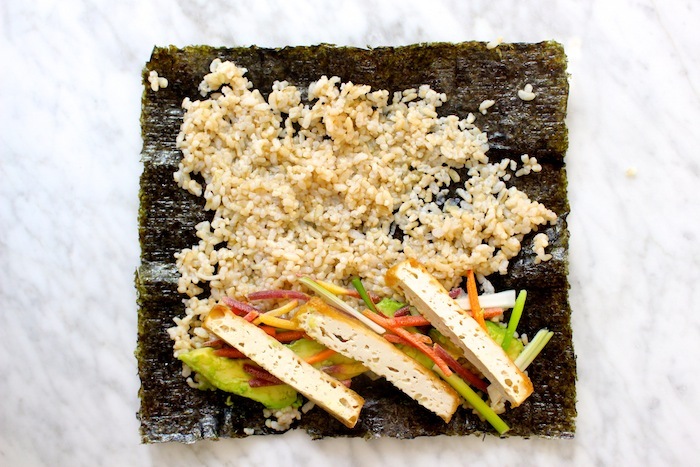 The nori sheets and the Paleo wraps (and collard greens) do best when you slather something sticky over it first–like cooked rice, cooked noodles, avocado, homemade hummus, etc. 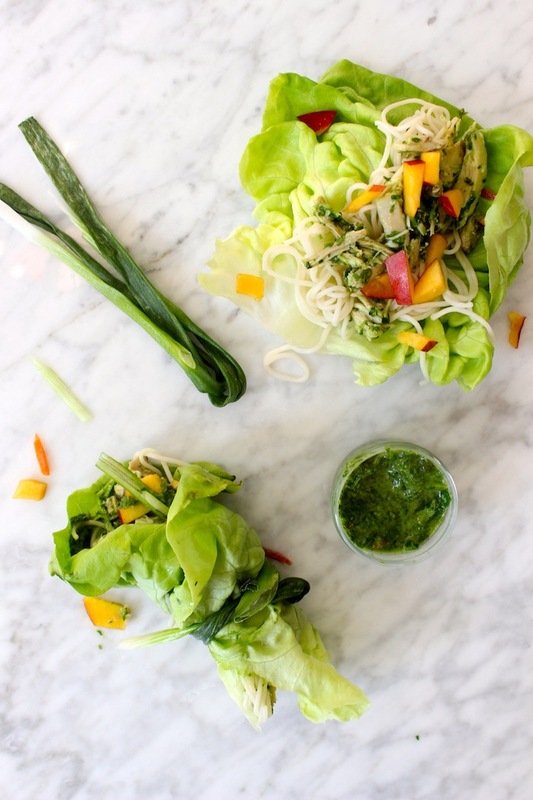 As for the butter lettuce, it doesn’t need any kind of edible glue and you can even pack the leaves separate from the filler, and assemble at lunch. Or use a green onion to tie them up. 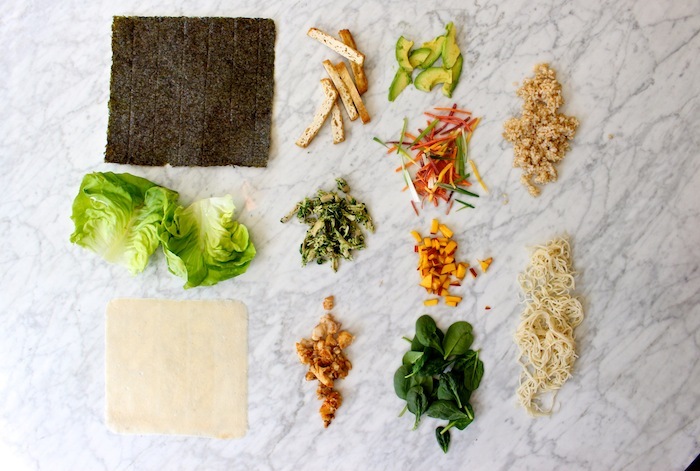 Now for the meat (or not meat) of the matter: Once you’ve prepped your sheet or leaf, you can add whatever you want. Or more importantly, whatever is in your fridge. That includes thinly sliced carrots, raw spinach, cooked fish or chicken or baked tofu. Fresh herbs. Sliced green onion. Diced fruit. Smashed and ready-to-eat beans. Literally, whatever you have. Especially if that “whatever” is bright and colorful and bursting with flavor. And finally, if you have the time or have the ingredients, pack yourself a dipping sauce and get a little fancy. Like this avocado tahini sesame dressing or my favorite Ginger People Sweet Ginger Chili Sauce. And if you happen to be sauceless, a slice of lime or lemon will go a long way. Then, pack it up. Whether you are off to work or having a sick day at the beach. And be sure to let the rest of us know how you plan to Rock the Roll this weekend and next week. Share in the comments below, on the Sodium Girl Facebook Page, or on Instagram with the hashtags #lowsogood. Til next week. Chow on. If you buy rice paper rolls, make sure they’re the imported ones from Vietnam or Asia, since I’ve noticed that locally produced ones are high in sodium, while the ones from Vietnam have minimal sodium, just a couple of milligrams per serve. Not sure where you’ll find them in USA but in Australia they’re readily available in Asian grocers, and much cheaper. I bought Paleo Wraps a few months ago and I still have yet to try them!!!! I need to whip them out ASAP! 🙂 I am a HUGE nori fan though!